The Interior Ministry has issued a list of Turkey's most wanted terrorists on Wednesday within the scope of a recently issued regulation, pledging rewards for those who supply intelligence about senior terrorist figures. Terrorists have been categorized into different colors –red, blue, green, and gray– depending on their threat level for the country. Accordingly, the U.S. based cleric Fethullah Gülen, PKK's senior figures Cemil Bayık, Murat Karayılan, Duran Kalkan, and ISIS-linked İlhami Balı are in the red category. The Interior Ministry published the list Wednesday on the newly-opened www.terorarananlar.pol.tr, to receive information about the terrorists. 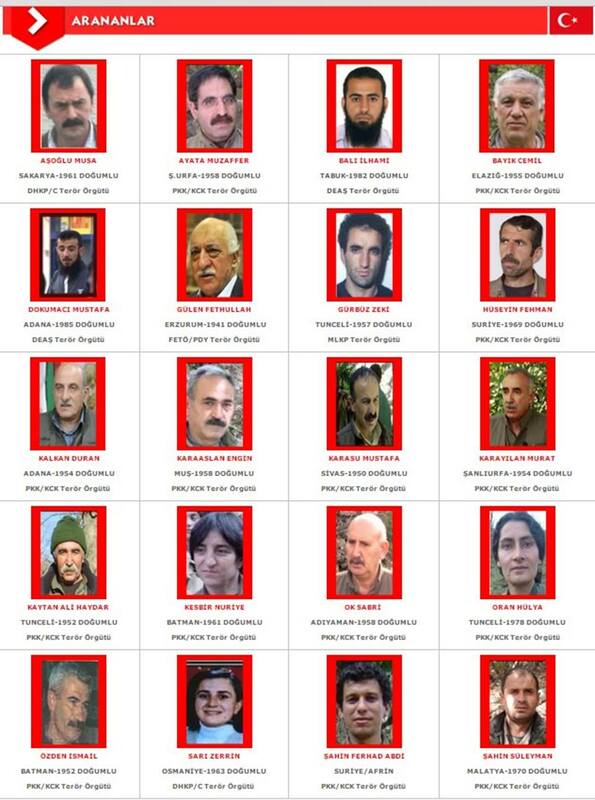 In total, 72 PKK, 12 ISIS, 11 Gülen terrorist organization, 2 DKHP-C (far-left Revolutionary People's Liberation Party Front) and 2 MLK-P (Marxist-Leninist Communist Party) members are included in the list, along with their full names, and date and place of births. As part of Turkey intensifying the fight against terror, Ankara issued a regulation pledging rewards for those who supply intelligence about terrorist figures, which is a method never applied before. The U.S. is well-known for this practice, especially regarding the capture of al-Qaida members. The regulation states: "Those who help in picking up the individuals who are sought in connection to terror" will be rewarded in compliance with the seniority of the terrorists. The reportings of terrorist activity can be made in person, but also via written notice, telephone or internet to the counter-terror units of police forces and gendarmeries or consulates and embassies abroad. Citizens can also use the new emergency anti-terror hotline "Alo 140",or "155" for police and "156" for the gendarmerie. The ministry also stated that the identifies of those who provide information relevant to arrest or capture of the listed terrorists will remain classified. 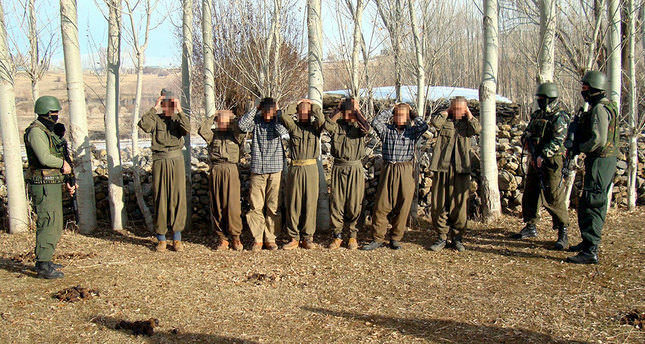 In the event of information leading to the capture of a low-level member, the reward is TL 200,000 ($68,432) and for senior level officials from the PKK and Kurdish Communities Union (KCK) – an umbrella organization that includes the PKK – the amount is TL 4 million. Ankara does not require informants to be Turkish citizens to receive the reward, as the regulation in the Official Gazette also does not specifically indicate such a condition. In the regulation it is also stated that the rewards will be designated by a commission, including police officers and members from the general command of the gendarmerie under the deputy undersecretary of the Interior Minister. As a never-before-seen practice, sources stress the government is quite determined in its fight against terror and that the regulation will be applied under the scope of the fight against the Islamic State of Iraq and al-Sham (ISIS) and the Revolutionary People's Liberation Party-Front (DHKP-C).